"How can this be happening?" The tales of devastation and tragedy from the news reports and the vivid images portrayed a surreal event of horrific measure. It was comparable to a living nightmare that I only witnessed, yet others endured. Feelings of incomprehension remain for me like ghosts. The Aftermath Lounge revisits the scenes of sadness and strength as author Margaret McMullan pays tribute to the 10th anniversary of Hurricane Katrina. 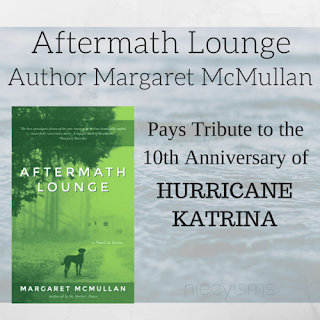 The acclaimed author and NEA recipient Margaret McMullan confronts the ghost of Hurricane Katrina in her new release, Aftermath Lounge, a Novel in Stories. A progressive decade has passed, ten years later, Post-Katrina aftermath stories live on in the fictional realm of the Aftermath Lounge. Evoking the feelings of fear and empathy for the survivors and memories of lives lost. 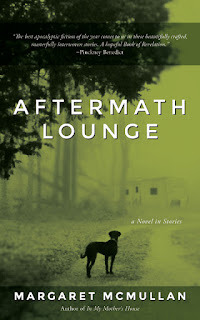 Born in part out of her family's deep connection to the community, Aftermath Lounge: A Novel in Stories, releases at the 10-year anniversary of Katrina and comprises fictional vignettes about the people of Pass Christian in the storm's wake. The stories are connected by a setting near to the author's heart—the McMullans' home, which was originally constructed in 1845 and restored by her father numerous times over the years. Award-winning author Margaret McMullan saw the destruction firsthand. Her family's historic Gulf Coast home—her father’s beloved southern jewel—was one of the houses in Pass Christian devastated by Katrina. Despite the chaos immediately following the storm, McMullan's family was among the first to rebuild and donated to the Red Cross, the Pass Christian fire station, and the Pass Christian library. It is a pleasure to share an intimate question and answer session with Aftermath Lounge author, Margeret McMullan. 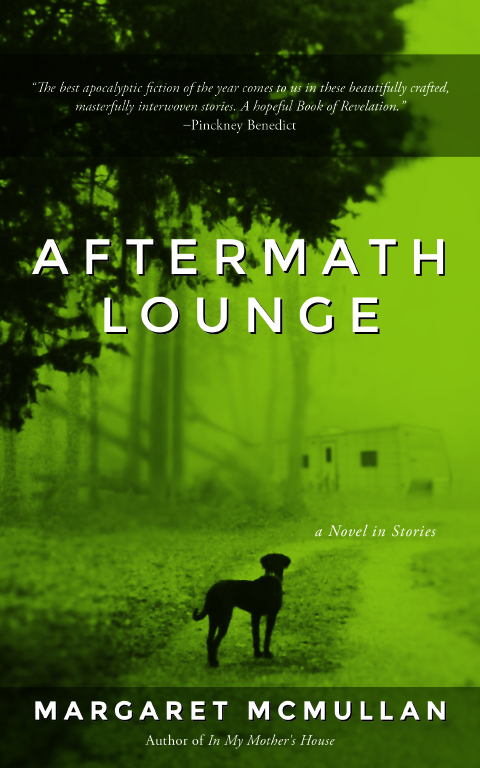 Aftermath Lounge: A Novel in Stories, honors the 10th anniversary of Hurricane Katrina. Please share details about your personal memories and experiences during those days when Hurricane Katrina first hit? MM- "Shortly after the storm hit, my husband and I drove down from Evansville, Indiana to Pass Christian, Mississippi. We saw aerial footage of the town and we could see that the roof on my parents’ house was mostly intact – that’s all we could see. We brought water and a lot of supplies to donate. There was a gas shortage then, and limited cell phone coverage. The closer we came to the town, the more it became like a war zone. The National Guard was there to keep people away, but we got through, thanks to a relative. The night before we left, my mother told us to forget about everything else- all she really wanted was the painting of her mother, which had been smuggled out of Vienna during WWII. We had house keys but there were no doors. When we got there, the house was gutted – the storm surge had essentially ripped through the house. Elizabeth Bishop wrote a wonderful villanelle called “One Art.” She wrote about losing small items like keys and an hour badly spent, then she progresses to the greater losses- her mother’s watch, a house, cities, rivers, a continent, and finally, a loved one. “The art of losing isn’t hard to master,” she starts. “So many things seem filled with the intent to be lost that their loss is no disaster.” I thought of that poem a lot." From my understanding, you and your family were extremely instrumental in helping Pass Christian in the process of moving toward rebuilding. Are there unforgettable moments that influenced your life and the framework for Aftermath Lounge during the critical periods of rebuilding? MM- "We saw so many people from all walks of life and they were suddenly homeless. My father organized financial donations. There were no fire trucks left after the storm, so he made sure Pass Christian got a fire truck. We were always big supporters of the library too. The Pass Christian policemen had stayed during the storm to make sure everyone was safe. They had tried to stay safe in the library, but then when the water rose, they had to shoot out the windows to swim away to safety. I used that information in the title story of Aftermath Lounge. These men were real heroes." Huricane Katrina was an overwhelming natural disaster that came upon us without mercy. At what point did you know from the moments preceding and following the storm's presence that someday you would commemorate in a novel? MM- "At first I just witnessed. I think that’s what writers do mostly. We witness. Then the material lets us know what it wants to become. I just took notes. Later stories started taking shape and they were all in different voices. It was the only way I could work at this material." My sympathies are extended to your family on the unimaginable loss of a historic mansion during Hurican Katrina. A great part of your inspiration for the novel came from your family's experiences of personal loss. How did your experiences in that home influence the stories of Aftermath Lounge? MM- "Well, it’s hardly a mansion, but I was surprised to discover just how much a house could mean. Everyone always says it’s just stuff, but there were so many collective memories there. When we stood and looked at everything so undone, it felt like our times spent there were gone too. Katrina had such a huge impact on the coast, on my family, and on me. I am always telling my students to write what they most care about, to write what keeps them up at night. I had to write about Katrina. I had written about the Civil War, Reconstruction and WWII, so I saw Katrina as an historical event. I treated the hurricane more as setting. It’s in the background. The human drama is in the forefront. I’m always interested in what people do or don't do in the face of real catastrophe. I didn’t want to write from one point of view either. I wanted to give voice to a variety of people because Katrina affected everyone." Always a personal interest, I am intrigued by the backstory of a completed work. How would you describe your journey during the writing process for this novel? MM- "There were so many news stories coming out at the time. I write nonfiction, but I couldn’t get my thoughts together. I couldn’t make sense of anything. Out of habit, I took a lot of notes. I could only deal with writing about all that was happening a little bit at a time. And my own personal story just wasn’t that interesting. I personally witnessed and experienced the best in human nature. People and communities came together and helped one another in the most meaningful way. They endured with a great deal of kindness and grace. So I chipped away at the material. I wanted to tell a community’s story." Thank you to the award-winning author Margaret McMullan for sharing her personal thoughts and experiences with niecyisms and nestlings. Margaret McMullan is the author of six award-winning novels including In My Mother's House (St. Martin's Press), Sources of Light (Houghton Mifflin Harcourt), Cashay (Houghton Mifflin Harcourt), When I Crossed No-Bob (Houghton Mifflin Harcourt), and How I Found the Strong (Houghton Mifflin Harcourt). Her writing has appeared in The Chicago Tribune, Ploughshares, Southern Accents, TriQuarterly, Michigan Quarterly Review, The Sun, and many other publications. 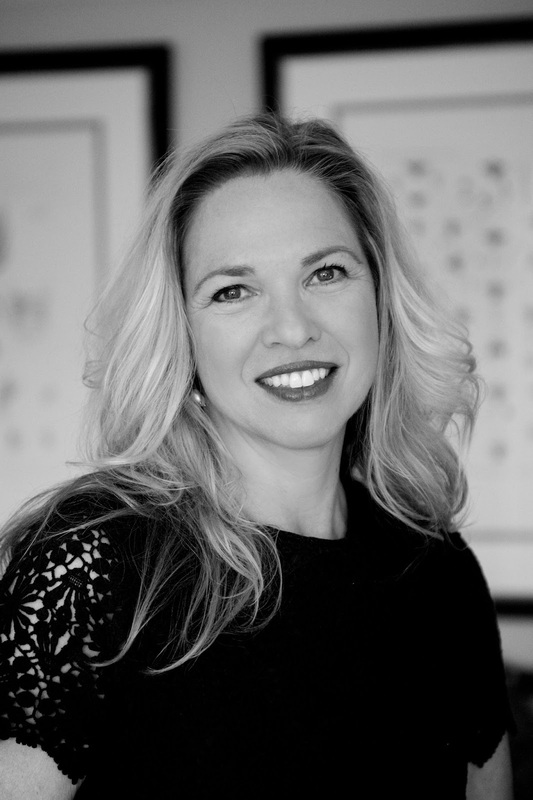 She received an NEA Fellowship in literature for Aftermath Lounge and a Fulbright award to teach at the University of Pécs in Pécs, Hungary, for her upcoming non-fiction work, Where the Angels Live. Her anthology of essays by 25 well-known female authors writing about their fathers, Every Father's Daughter (McPherson & Company), is also available in Spring 2015. She currently holds the Melvin Peterson Endowed Chair in Creative Writing at the University of Evansville in Indiana. I have received Aftermath Lounge for the purpose of facilitating this review. As the owner of this blog, niecyisms and nestlings, I am compensated to provide my opinion on products, services, websites and various other topics. This blog may contain affiliate links. Even though, as the writer/owner of this blog receiving compensation for posts or advertisements, I will always give my honest opinions, findings, beliefs or experiences on those topics or products. This blog abides by word of mouth marketing standards. I believe in the honesty of relationship, opinion and identity. The views and opinions expressed on this blog are purely my own. Any product claim, statistic, quote or other representation about a product or service should be verified with the manufacturer, provider or party in question.